As mentioned in our previous posts about the Report Cards initiative, today we’re sharing one of the custom-built private templates. If you like the way it looks, feel free to let chat in anytime and we’ll enable the template in your account, and help set it up just the way you like! The Ash Tree Learning Center Academy in Savannah, Georgia reports quarterly grades and semesterly and final averages for their middle-school and high-school level students. The format is classic and informative, and their template itself is lovely and easy to read. Let’s check out a sample final report card! This new template is designed by the fantastic team over at Ash Tree Learning Center Academy, based off of a public QuickSchools template – Three-Four Galore – and built by our awesome support team. Great work everyone! 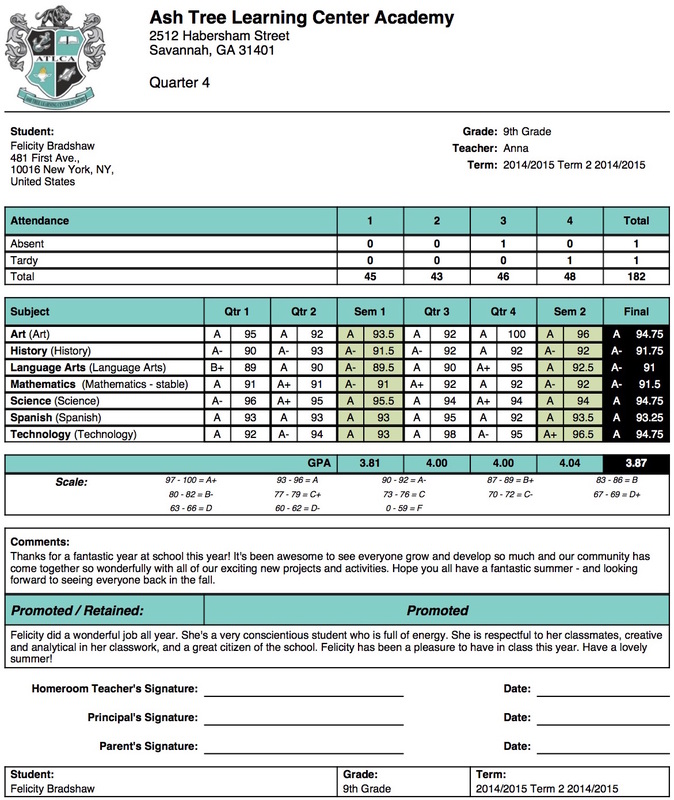 If this powerful and flexible template looks like it might be helpful for your school’s report cards, please feel free to chat in any time and request it! We’d be thrilled to help you get your Report Card template all set up.